2 BEDROOMS, BATHROOM, WC, KITCHEN & LOUNGE - Enjoys parking to front, own area of garden, gas central heating, double glazing & vacant possession. Leasehold tenure, Must be viewed. A self-contained first floor flat, one of two flats within this semi-detached house, set under a pitched tiled roof. Sandringham Road is located on the level approximately 1 mile from the high street, town centre and sea front and within easy reach of local facilities including schools and shops. The property enjoys gas central heating, UPVC double glazing and is approached via own entrance to the front of the building with internal stairs to first floor landing. 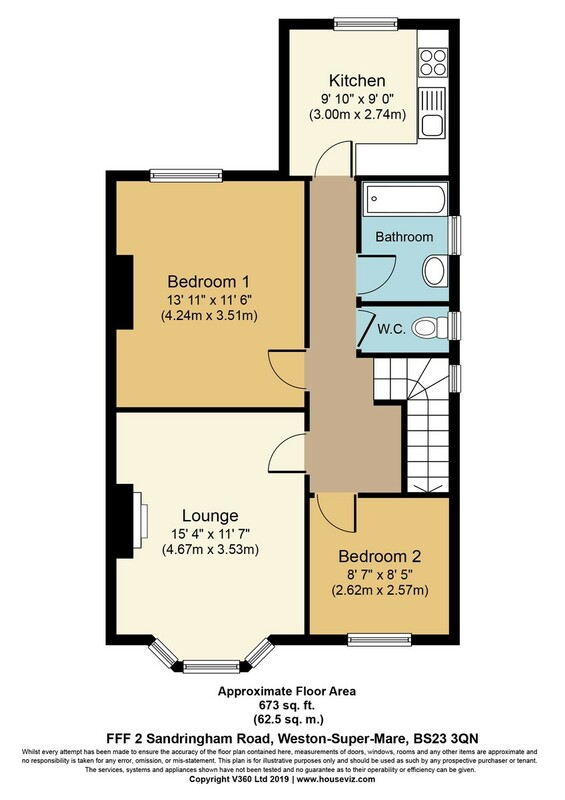 The accommodation briefly comprises; lounge, kitchen, 2 bedrooms, bathroom and separate WC, together with own area of garden, shed and a parking space. FIRST FLOOR LANDING Loft access, picture rail, radiator, 2 power points, UPVC double glazed side window. LOUNGE 15'4" (4.67m) into UPVC double glazed bay window to front x 11'7" (3.53m) into recess, fireplace with timber surround and coal-effect gas fire, radiator, picture rail, TV point, telephone point. KITCHEN 9' 10" x 9' 0" (3m x 2.74m) Fitted with a range of units including single drainer stainless steel sink unit with mixer tap, range of base cupboards, roll edged worktops, tiled surrounds, matching wall cupboards, 4-ring gas hob and electric oven, stainless steel extractor hood over, plumbing for washing machine, radiator, gas fired boiler providing hot water and central heating, double glazed window to rear. BEDROOM 1 13' 11" x 11' 6" (4.24m x 3.51m) Picture rail, radiator, double glazed window to rear. BEDROOM 2 8' 7" x 8' 5" (2.62m x 2.57m) Picture rail, radiator, double glazed window to front. BATHROOM Fitted with modern white suite of panelled bath with shower over, curtain and rail, pedestal wash hand basin, tiled surrounds, radiator, double glazed window. SEPARATE WC Low-level WC, radiator, double glazed side window. REAR GARDEN 28' 6" x 37' 0" (8.69m x 11.28m) Own area of garden, predominantly fenced and laid to level lawn with garden shed.